A NEW moisturiser to target facial redness! Here at Katrinas our team is very excited for the long awaited launch of Ultraceutical’s Ultra Red Action Moisturiser. 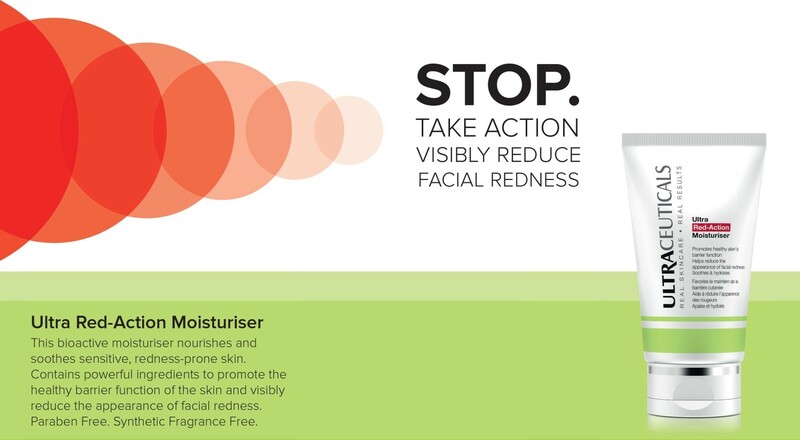 Facial redness affects many people and can be caused by something as simple as over using an active product to the complex condition of Acne Rosacea. Those that suffer from facial redness will be pleased to know that this moisturiser exists and will love the soothing and calming effect this has on a red, hot or aggravated skin. This fabulous NEW product can be used in the morning and/or the evening after cleansing to hydrate, increase the barrier function, strengthen and reduce inflammation. It is an extremely effective, light weight and fast acting moisturiser that contains all the base ingredients that the other Ultraceuticals moisturisers have with the addition of Niacinamide and Pro Vitamin C to pack that extra punch against facial redness. Our team of skin experts here at Katrinas recommends you try out the new Ultra Red Action Moisturiser used in conjunction with Ultra B2 Hydrating Serum. This combination will be the ultimate inflammation reducer. Owning or managing your own salon is something many people dream of. Unfortunately for many it remains just that – an idea and a dream. Here at Katrinas School of Hair and Beauty we are about nurturing ideas and helping people work towards making their dreams a reality. One way that we are doing this is by offering the Diploma of Salon Management. Welcome 2015 and welcome to Katrinas new website. We’ve been working hard over the last couple of months to completely rebuild our website and what you now see is the fruit of those labours. It’s been a fantastic experience and loads of fun creating a website that we are all very proud of.